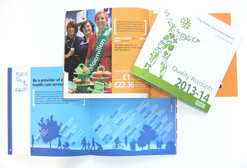 Innovative Graphics have just delivered the last of three reports for City Health Care Partnership CIC. Each report (Social Accounts, Quality Accounts and Annual Report) were won through a tender process and involved a creative proposal, artworks and print handling. CHCP CIC is an independent ‘for better profit’ co-owned business providing community health and integrated social care services to over half a million local people in Hull, the East Riding of Yorkshire and Knowsley, Merseyside. The reports highlight and review the organisations achievements during the past year.